% Under Contract Showing Changes. Many of the brokers that I chat with about stats are commenting on how they feel a change taking place in the market. This change isn’t uniform across Boulder County yet, but I suspect by the end of this year, we’ll all agree the days of instant offers and annual appreciation in the teens will have ended. So aside from gut feel, what stats are starting to show a change? One of the ones I keep an eye on is the percent of single family homes in each area that is under contract. You can see in the chart below that we have rounded over the top in this metric. While there was a small drop from 2013 to 2014 that ended up not signaling a change, the drop so far from 2016 to 2017 seems significant enough to signal a change. 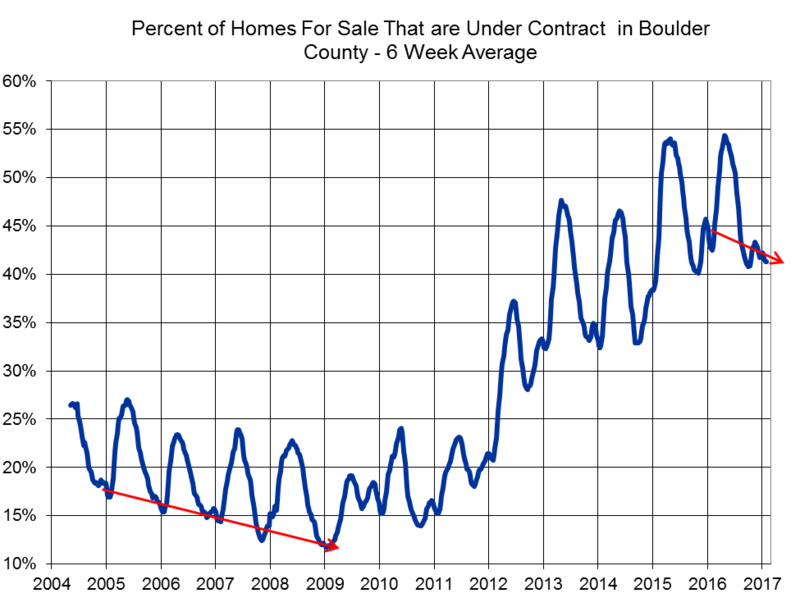 We’ll eventually have further data to confirm this change and then get an idea for the slope of the change. Once we have a confirmed shape to the new direction, we can call when we break out of the new trend at some point in the future. I maintain these same stats for each sub-area in the County. That chart is more interesting in that you can watch the individual cities move up and down as compared to the other cities in the County. I have been tracking these stats since 2004 and a very interesting change has occurred since then. 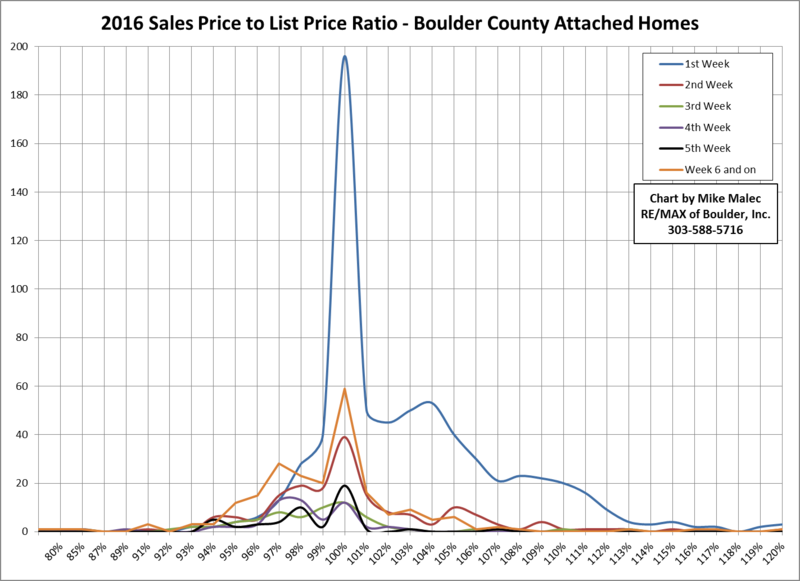 Back then, the City of Boulder was always a top performer in this chart, frequently having the highest percentage of homes under contract in the County. 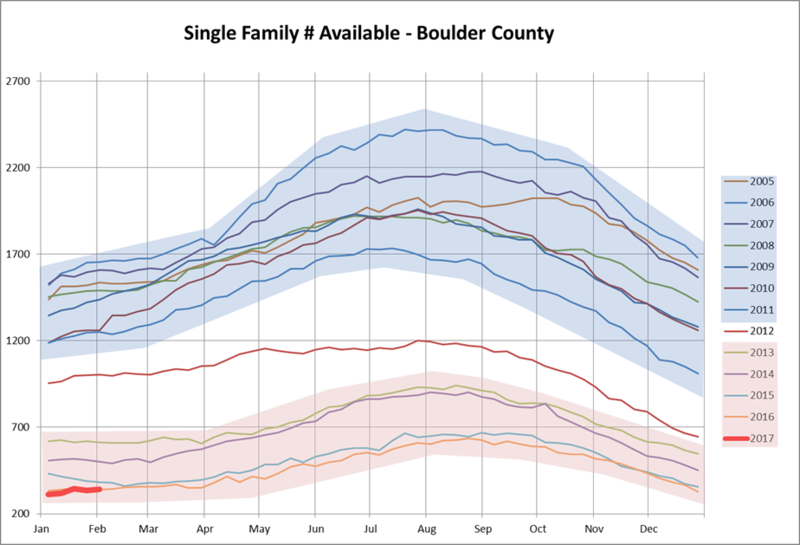 Since the Great Recession however, the City of Boulder has been towards the bottom of the chart and lately has been tracking below the County average. Longmont and Erie back then were usually at the bottom of the chart but recently they’ve been trending much higher. I think this change is a reflection of affordability. 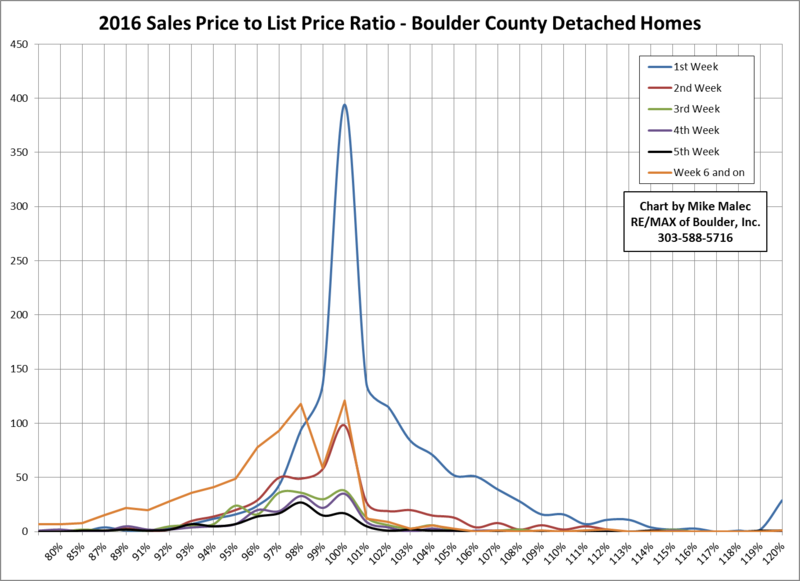 As prices within the City of Boulder have climbed dramatically, the relatively lower prices further out in the County have driven demand outside of the City. One other observation, the Suburban Plains have been a perennial underperformer compared to the other areas within the County. We’ll be keeping an eye on this chart as the market potentially shifts. Dramatic changes in the positioning of the competing subareas will give us some insight to what’s happening and how big a factor affordability is playing. Hope everyone had a wonderful Fourth of July! One of the signs I’ve been watching for that could indicate our market is changing is an increase in available inventory. As you can see in the chart below, we’re starting to see that increase. 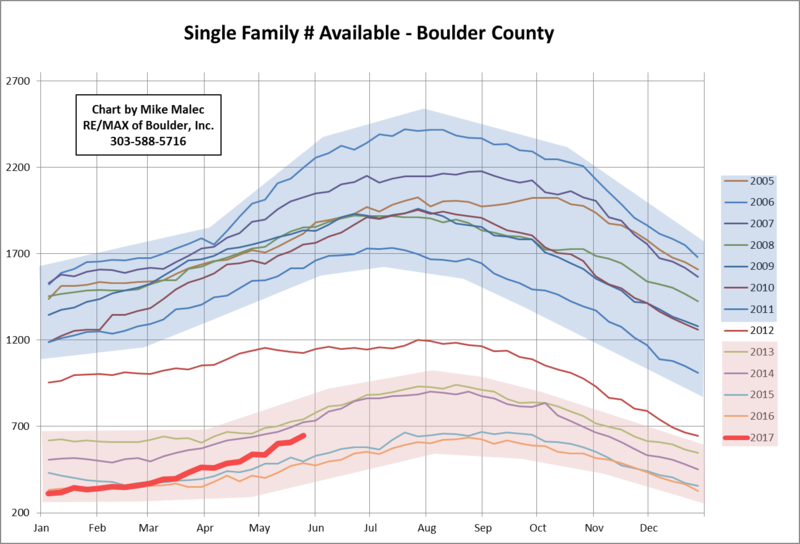 2017 is the first year in which we have not set new lows in the number of homes available for sale across Boulder County. A definite change in the market, but determining the significance is more challenging. If the number of homes available for sale peaks and then drops back into the range of 2015 & 2016, I think we can say this was a temporary quirk of the market this year. If instead we see the # available continue to climb throughout the year that would be more troubling. If we see the # available leave the red zone and start transitioning back towards the blue zone of the years 2005 through 2011 that would be even more concerning for continued price appreciation. It is also hard to tell if this increase is due to larger numbers of sellers or fewer numbers of buyers snatching properties off the market. More sellers would be better for the health of the market than fewer buyers. 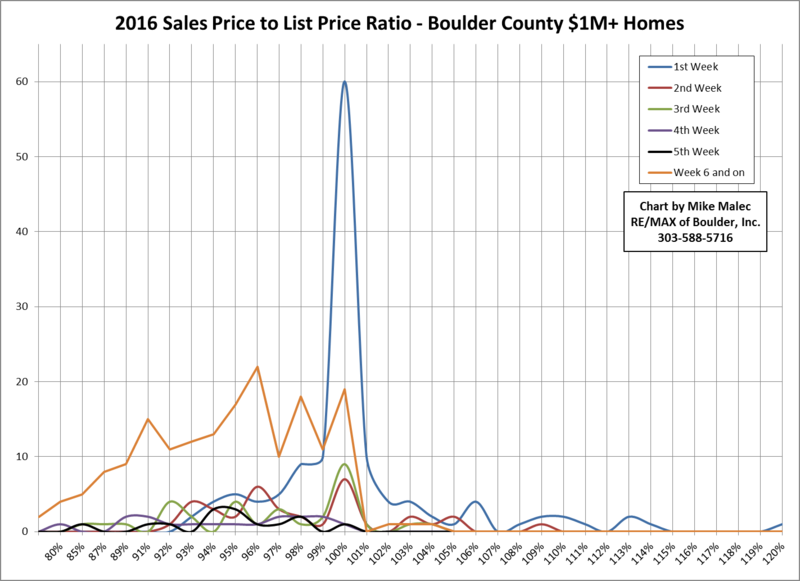 There are some long term trends occurring within Boulder County however that make comparisons to previous years more difficult. We may have transitioned to an era where we may not get back up to those higher inventory levels. Generally higher interest rates, lack of substantial new construction, continued population growth, and very low unemployment may all combine to create a market where we won’t again see the high levels of inventory we saw from 2005-2011 as people are more likely to stay in their homes. If this is true and the red zone is our new normal, than a move back to the top of that area may be concerning enough. This is one I’ll be watching throughout the summer. 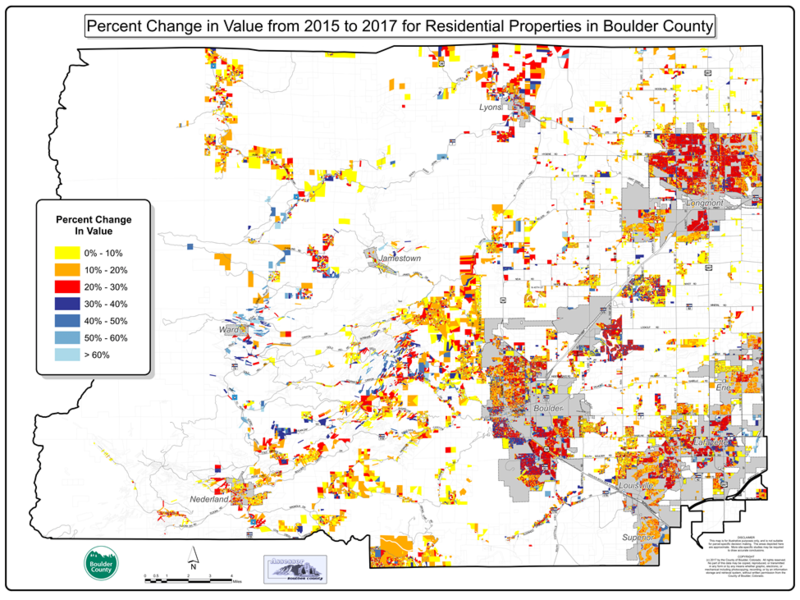 I was recently at a meeting with the Boulder County Assessor and this year’s property re-appraisal cycle is going to be very interesting. The Boulder Assessor is forecasting that single family residential values will jump 28-30% since the last re-appraisal May 1, 2015. The change for attached homes will be even greater. Many homeowners out there are in for a spring surprise. The one bright spot on the horizon is that the State Legislature is changing the assessment rate for the first time since 2003 and is considering lowering it to 7.20% from 7.96%. This number isn’t fully set in stone yet but must be set prior to the end of the legislative year on May 10th. The net effect of these changes is that residential property tax bills should increase, but not the same 28-30% increase we will see in valuations. The Denver Post has great maps from seven metro area Counties showing their forecast changes in value. Here’s that link and below, Boulder County’s map. Last month we talked about the Sales Price to List Price ratios for properties that sold in 2016. This month I wanted to take a look at that same statistic but just for properties that sold for over a million dollars after concessions were removed from the sales price. In 2016, 412 properties met this criteria, a mix of single family homes and downtown Boulder attached loft type properties. I was surprised once I ran this analysis how closely the over a million market matched the overall market but there were some differences. You can see in this first chart that million dollar plus properties that sell quickly mostly sold for their asking price. In the overall market, the majority of properties were selling in the first week on the market while in the million dollar plus market the majority of properties sold in week 6 or later. The million dollar plus market also does not show as much strength in properties selling for over asking price. The peaks in weeks 4-6 for the million dollar plus market also were all in the greater than a 5% discount off asking price category. For the overall market, the greater than 5% discount off asking category never was the majority of sales in any week. Aside from all of these differences, I was surprised at how the chart of this data wasn’t substantially different than the chart of the overall market. Both charts have a strong spike in week one for sales right at asking price. Both charts have peaks in weeks 2 & 3 right at asking price. Both charts show strength in week 1 sales over asking price. I went into this analysis expecting the million dollar plus market to be dramatically different. The reality is that there were minor differences but it was generally the same. It will be interesting to look at this data again next year and see if and how it changes. Until then, have a great spring. At the start of each year, I’m always analyzing the sold data from the previous year and this month I wanted to take a look at the sales price to list price ratios of all the 2016 sold properties. Last year I originally ran this analysis without removing seller concessions from the sales prices. This year, all of the data below has already had sales concessions removed from the sold prices, so the sales price to list price ratios should be as accurate as possible. The first analysis was just to look at the percent of the market that is selling for over asking price and how that metric is trending over time. In 2016, the percentage of Single Family homes selling for over asking price continued to climb, but the increase appears to be slowing. 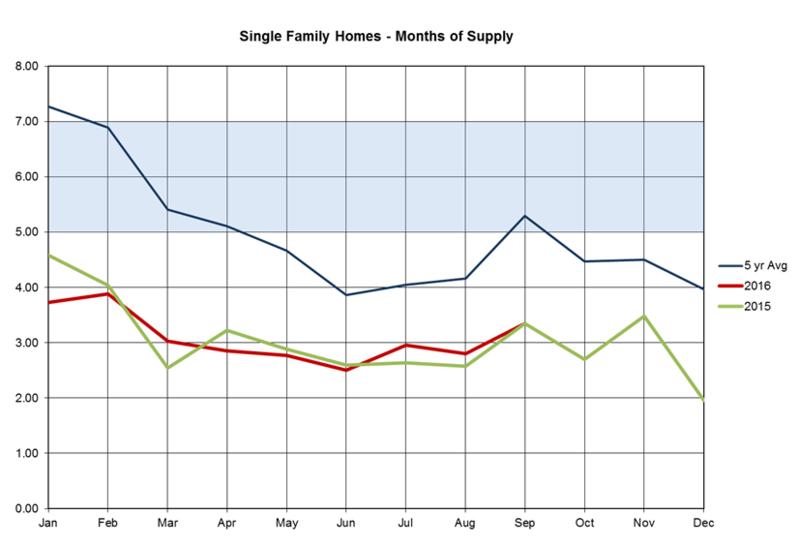 For Attached homes, the increase has not only slowed but dropped just over 1%. Hard to tell how significant this Attached change is if at all. If we get a second year of drop in the over asking percentages after the end of 2017 that could signal a change in the trend. Hard to believe that over half of all Single Family homes and almost ¾ of Attached homes sold for over the asking price again in 2016. The second stat I wanted to revisit again was the sales price to asking price ratios and how those ratios change depending on how quickly the home goes under contract. As you would expect, the more quickly the home gets snatched up, the more likely the sales price was to be at or over the asking price. In 2016, 75.81% of the homes that went under contract within the first week of their market entry eventually sold for over their asking price. As we saw in 2015, not a lot of negotiating room for properties during the first week on the market. Also as expected, the percent of homes that sell for asking price or better drops the longer the home sits on the market without an offer. The one quirk to this IRES data that I haven’t been able to eliminate is the possible inclusion of properties that were withdrawn and then re-entered with a new MLS # and possible new asking price that then sell quickly even though they have a lengthy combined days on market. 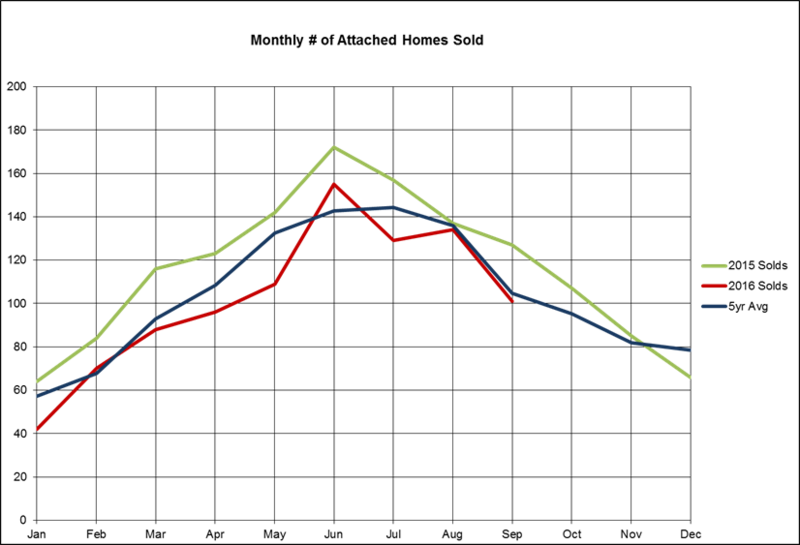 In this graph, I’ve plotted, in separate colors, the sales per the week they went under contract. The expected strength in the properties that went under contract in the first week is displayed in blue. As we saw in 2015, those “under contract in the first week” properties had numerous sales that were at asking price through sales that were up to 10% over asking price. It’s not until homes have been for sale into the third week that you start to see the peaks in the chart at something less than asking price. One other quirk in the data that I didn’t attempt to adjust for was for properties that went under contract, had a buyer back out and then re-entered the market. As with most of our statistics lately, looking at these same stats for Attached Homes shows an even stronger seller’s market than the Single Family homes. In 2016, Attached homes that went under contract within the first week on the market sold for asking price or better 86.23% of the time. More than half of all 2016 sales of Attached homes went under contract in the first week. As we saw in 2015, there is an odd increase in the sales price to list price ratio when you get to week 5 and beyond. My best guess to explain this phenomenon is that in condos you start seeing successful price reductions more quickly than in single family homes. In the chart below, we take the same Attached Home data and display that date per the week in which the property went under contract. As in the Single Family graph, you see great strength in the properties that go under contract in the first week. Oddly, for Attached Homes, only in properties that go under contract in week 4 do we see the numbers peak at less than asking price. All of these numbers are from last year and this year feels subjectively to be just a touch slower. It will be very interesting to revisit these numbers after the end of 2017 and see what changes occurred. Have a great start to 2017. As is typical at the start of every year, we look back at what happened in the previous year and attempt to sift the tea leaves into some meaningful patterns to help determine where we’re headed. As with any time you’re trying to interpret data sets, different people can see different patterns, but this is my take based on IRES only data. 2016 remained a great time to be a seller and a frustrating time to be a buyer. While many sellers still enjoyed multiple offers, it felt as if there were fewer numbers of offers in our multiple offer situations. In 2015 you might have seen 8 offers for a new listing where in 2016, maybe you only saw 3 offers. Hard to complain about as there were still multiple offers, but a change from 2015. It also felt like buyers who waited until mid-summer to start making offers had a little bit more leverage than they did in 2015. One thing that is apparent to me as I go through the 2016 stats is that we are starting to see some wobbles, different metrics telling opposing stories about where the market is heading, typically a sign that change is coming. Sales in 2016 did drop compared to 2015 with 374 fewer Single Family home sales for a total of 3,176 sales and 126 fewer Attached Dwelling home sales for a total of 1,254 sales. The market effect of this drop in home sales is hard to quantify. The number of homes listed for sale also dropped but on a percentage basis, the number of sales dropped more. So if demand and supply are both dropping, but demand is dropping more than supply, what does that mean? Probably a sign that price appreciation is set to slow down. With prices having risen as much as they have, the continued drop in the number of sellers remains perplexing. I think many sellers are sitting on the sidelines due to a combination of a lack of good replacement options, the cost of those replacement options and the rise in interest rates that combined typically make a change to a new home a difficult decision to make. With the loss of these sellers who choose to move, we’re left with the lower number of sellers who have to move due to life changes that necessitate a change, such as death, divorce, job change, etc. The above chart shows that we continue to see lower levels of homes for sale than we’ve seen at any time in the last 13 years. I also don’t see any sudden moves in this chart that show that supply is set to dramatically increase in 2017. We remain firmly in the bottom of the red area that is our new normal that we’ve seen since 2013. For the people that see a bubble in our rapid price appreciation, I say that it is really hard to have a bubble with the constrained supply shown in this chart. I don’t expect to see major changes in our market strength until we see major changes in this chart and supply that rises up and out of the red area. While the chart above gives me confidence in the strength of our market moving ahead, the chart below does give me some pause. This chart is one of those wobbles I referenced above, a metric that is trending in a direction that would imply the market is changing, a possible leading indicator. In the chart below, you’ll see a downward red arrow at the top right connecting the % of Homes Under Contract at the start of Jan. 2016 with the same number at the start of 2017. 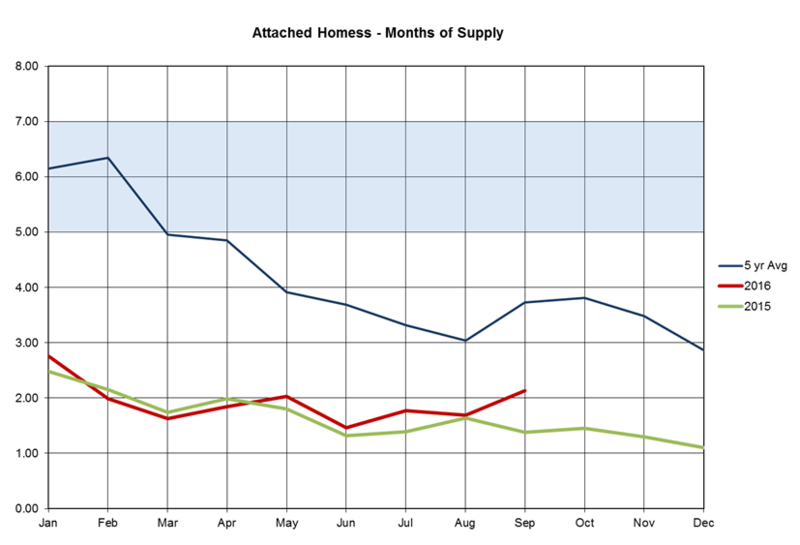 The downward slope of that line tells me our market is slowing even though we’re still seeing multiple offers and buyers fighting over properties in the lower price points. If you look back in this chart to the period from 2005 to 2009, you’ll see a similar downward trending red arrow in the lower left that led us into our last downturn. At a recent economic forecast presentation that I attended, the speaker joked that economists can find trends in any two points and while that joke got a laugh, we’ll want to see some further confirmation of the new trend in the chart below before we start to be too concerned. One other trend I see is that homes that sell the first week are very active with possible multiple offers, but if the property lasts on the market longer than a week, the showing activity slows quickly. We have really trained our buyers to be ready to jump on properties that meet their needs but once a property gets past that initial rush there can be a showing lull. The sales price to list price ratio also quickly drops once a property remains on the market past the initial week. I’ll have those stats in next month’s article. For 2017, I see the beginning of the year looking a lot like 2016. I expect we’ll see a very active market through the spring with bidding wars in the lower price points. As you move up in price, the activity will moderate some, but these properties should also expect to see an active spring. We’ll have to see if we get the mid-summer lull we’ve seen over the last three years. There has been a debate about the higher interest rates we’ve seen so far this year, will they hurt or help the market. In the short term, I think the higher rates are making many buyers jump off the fence and buy something before rates get even higher which is helping the market activity. In the long term though, higher rates will slow the market down. 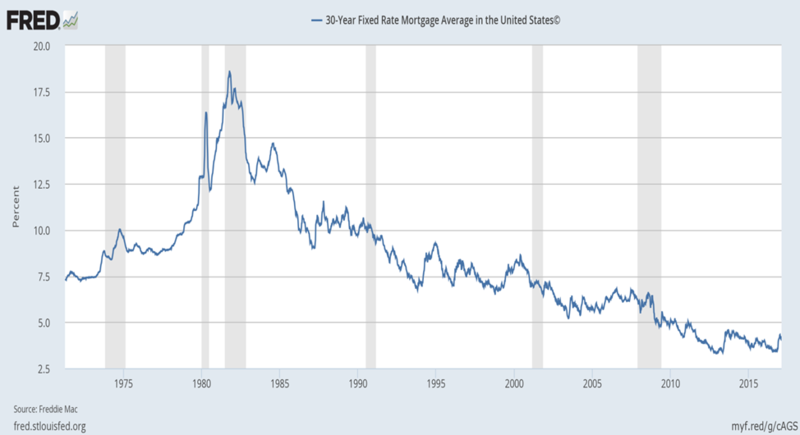 We have been at historic mortgage rates for so long now, we’ve forgotten how good rates are. 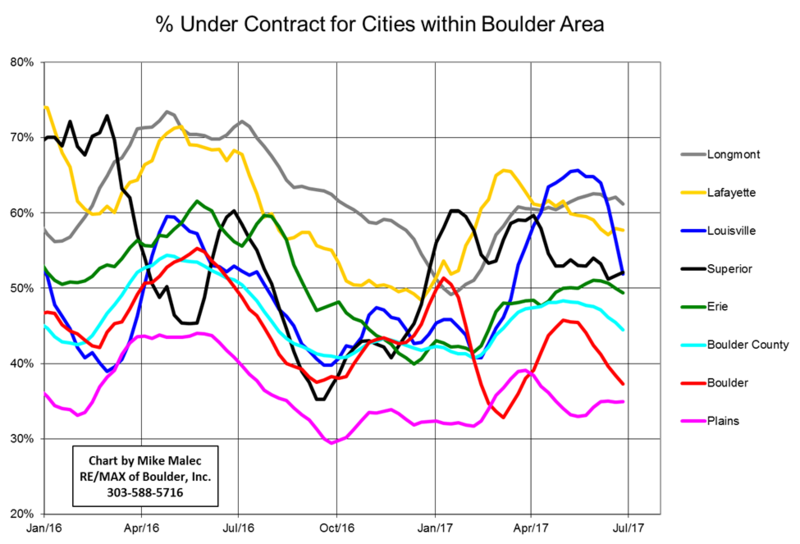 A chart of interest rates going back to 1974 should add some perspective. While there have been three periods of lower rates than today, they’ve all been since 2011 and we’ve had good strong markets many times since 1974 with much higher rates. When rates do rise, we’ll survive. 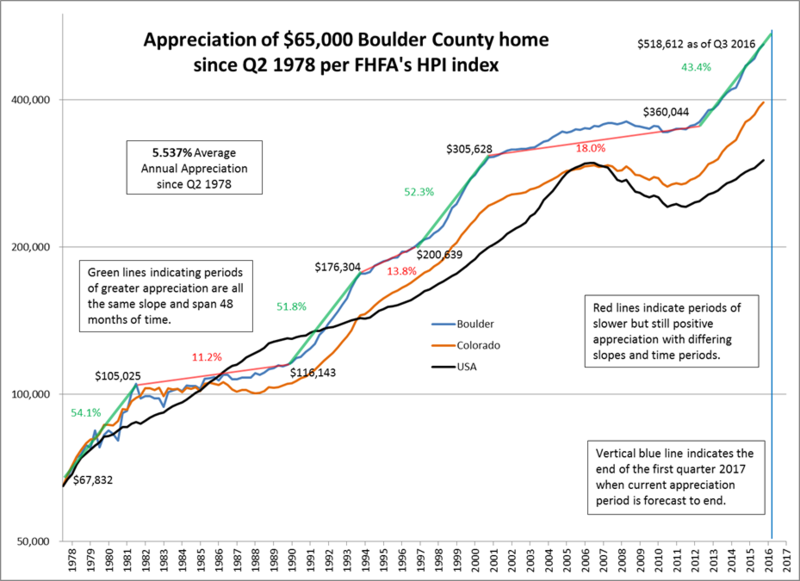 I recently updated the FHFA stats for Boulder County and updated my chart of the appreciation of a $65,000 home in Boulder County from 1978 to the 3rd Quarter of 2016. After some further digging on the FHFA site, I was also able to add lines showing how that same 1978 $65,000 home would have appreciated as an average of the entire State of Colorado and as an average of the entire United States. Some interesting things to see in this chart. The average US home has just now topped the high point in values prior to the Great Recession. Contrast that with the average Boulder County home which has added just over $150,000 in value since the top prior to the Great Recession. 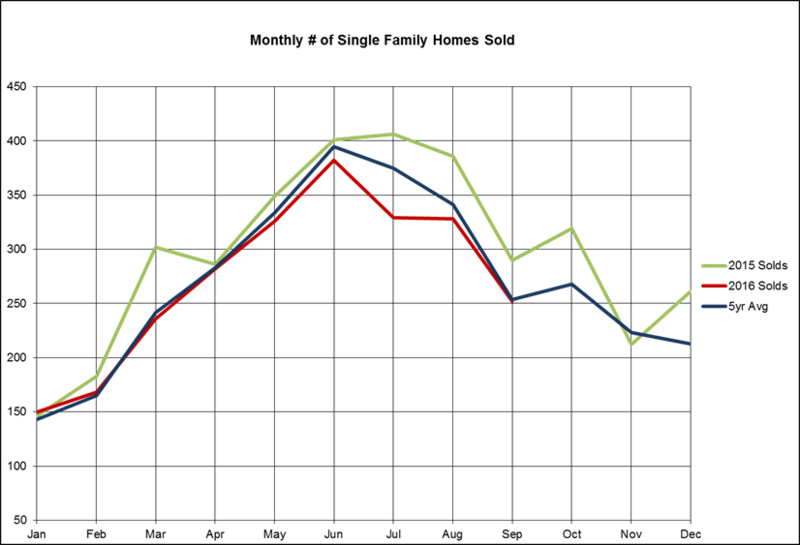 It’s also interesting to watch the different cycles in value for Colorado versus the US as a whole. Colorado outperformed the US in the early 80’s while the US then outperformed Colorado from the mid 80’s through the mid 90’s. From the mid 90’s on, Colorado has outperformed the US. No wonder we’re such a happy place to live. I hope everyone has a very happy & prosperous 2017. As we get closer to the holidays and the end of the year, it’s safe to start making some assumptions about how the 2016 numbers are going to play out for the Boulder County market. 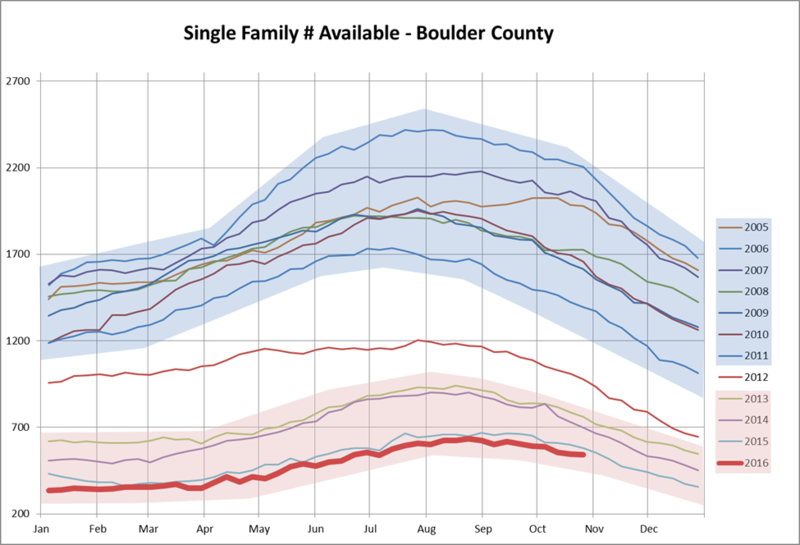 The big story that we’ve seen this year is that we’ve had fewer sales of both single family homes and attached homes in Boulder County when compared to 2015 and to the average of the previous 5 years. Dropping numbers of sales would typically indicate a slowing market, but our inventory has been dropping even more than our sales preventing the market from slowing. You can also make a strong case that our dropping sales are likely to have been caused by the historically constrained inventory. In the chart below, I’ve drawn a blue shaded area around the inventory that existed in the years of 2005 through 2011. That was the old normal range for inventory in our market. 2012 was the transition year where we went from the old normal levels of inventory to the new levels of very constrained inventory in the red shaded area of 2013 through 2016. As of October 24th, there were 543 single family homes for sale across all of Boulder that were not already under contract. That number is about one-third of the average of the available inventory that existed in the blue shaded area. Hard to have increasing sales when there are so few sellers. Many of the metrics that we watch are starting to display some changes in trend. We’re also starting to see some trend changes in individual markets. I think both of these are signs that we’re nearing the end of the current cycle of rapid appreciation. It will be interesting to watch the inventory build next year. Will it stay in the constrained red zone or will we see a transition back to the blue zone in the chart below? When we analyze the low inventory numbers and the absorption rates derived from the sales numbers, we can create another metric, Months of Supply. 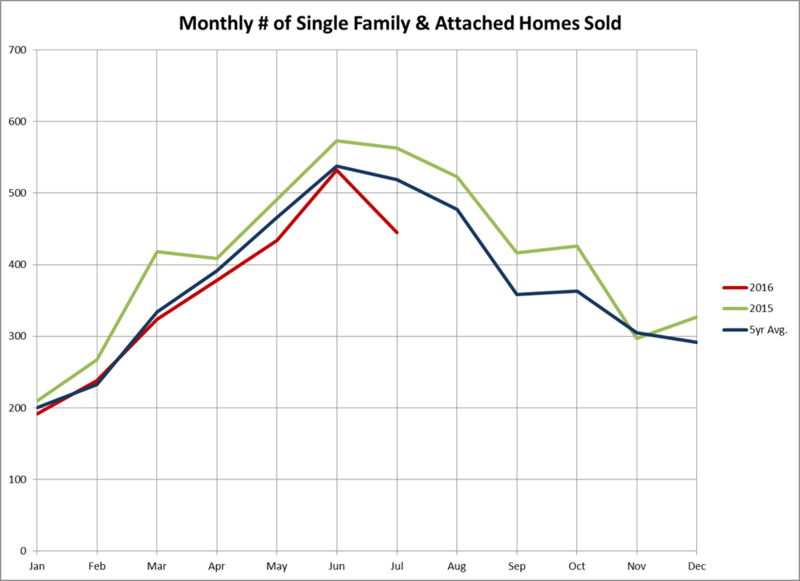 This shows how quickly every home on the market would sell based upon the previous month’s sales. In this metric, anything less than 5 months of supply indicates a seller’s market, territory we’ve firmly remained in for the last two years. This is another metric that we’ll be watching in 2017 as it reacts relatively quickly to market changes. Watching the market through the remainder of this year and into 2017 is going to be interesting and telling. I hope everyone has a wonderful fall! We’ve talked about the FHFA HPI index before. To me, this is the best home values index to watch as it compares the value of the same home as the value changes over time as reported in sale and refinance appraisals, comparing apples to apples. Here are some significant findings from the most recent HPI report which covers the Second Quarter of 2016. “Although the appreciation rate for the second quarter was of similar magnitude to what we’ve been seeing for several years now, a close look at the month-over-month price changes during the quarter reveals a potentially significant market shift,” said FHFA Supervisory Economist Andrew Leventis. “Our monthly price index indicates that in each of the three months of the quarter, the increase was only 0.2 percent. This is a much more modest pace of appreciation than we’ve seen in some time and most likely reflects accumulated pressures from significantly reduced home affordability,” Leventis said. Home prices rose in every state except Vermont between the second quarter of 2015 and the second quarter of 2016. The top five states in annual appreciation were: 1) Oregon 11.7 percent; 2) Washington 10.3 percent; 3) Colorado 10.2 percent; 4) Florida 10.0 percent; and 5) Nevada 9.6 percent. Among the 100 most populated metropolitan areas in the U.S., annual price increases were greatest in North Port-Sarasota-Bradenton, FL, where prices increased by 15.7 percent. Prices were weakest in Bridgeport-Stamford-Norwalk, CT, where they fell 3.3 percent. Of the nine census divisions, the Mountain division experienced the strongest increase in the second quarter, posting a 1.9 percent quarterly increase and an 8.1 percent increase since the second quarter of last year. House price appreciation was weakest in the Middle Atlantic division, where prices rose 0.6 percent from the last quarter. Boulder is the top MSA in the country when the MSA’s are ranked by the highest rates of annual appreciation as of the second quarter of 2016. Aside from Boulder, Colorado also claimed three more of the top 10 spots highlighted in yellow below. The Boulder MSA also remains the top MSA in the country for appreciation since the first quarter of 1991 while the Denver MSA is #2 and the Ft. Collins MSA is #7. Here’s a look at the FHFA annual appreciation numbers over time for the US, Colorado, the Denver MSA and the Boulder MSA. The Denver MSA includes all of Metro Denver except for Boulder County. The Boulder MSA includes all of Boulder County. 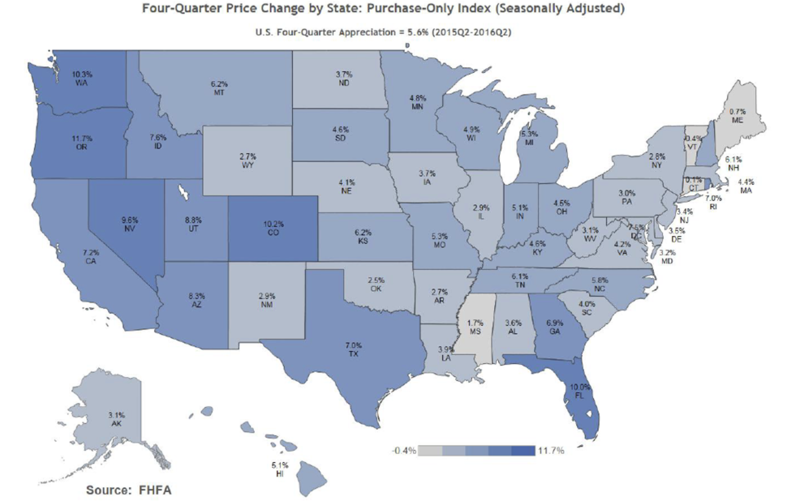 And from FHFA, price appreciation across the entire US. Lately, at the start of August I always wonder if the market is slowing or if the recent weakness I’ve felt is just due to a mid-summer slump. For the third summer in a row, Mid-June through July has felt slow to me and to many of the other brokers I’ve spoken to. I’ve heard lots of reasons for this; clients on vacation, brokers on vacation, buyers burnt out after the spring frenzy, and etc. but I’m not sure there is one sole cause of the mid-summer slump. The fear I have every year is that the mid-summer slump isn’t a typical annual occurrence, but the start of a market trend change. Usually though as we get into August it feels like market activity starts to recover. Here’s a look at a graph charting the performance of 2016 so far as compared to 2015. 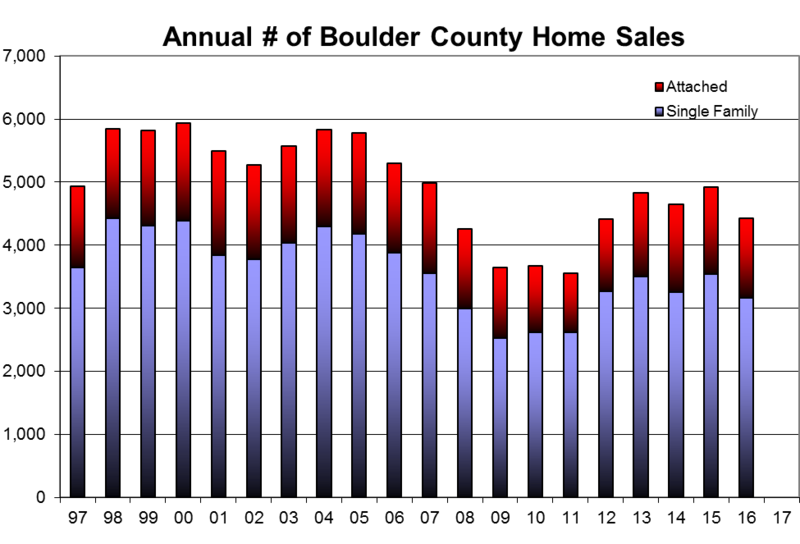 The numbers for July have just been released and as late July closings get added, the dip at the end of the graph will improve but sales definitely peaked in June which is typical. Another way of judging when the market feels to have peaked is to look the percent of homes under contract. 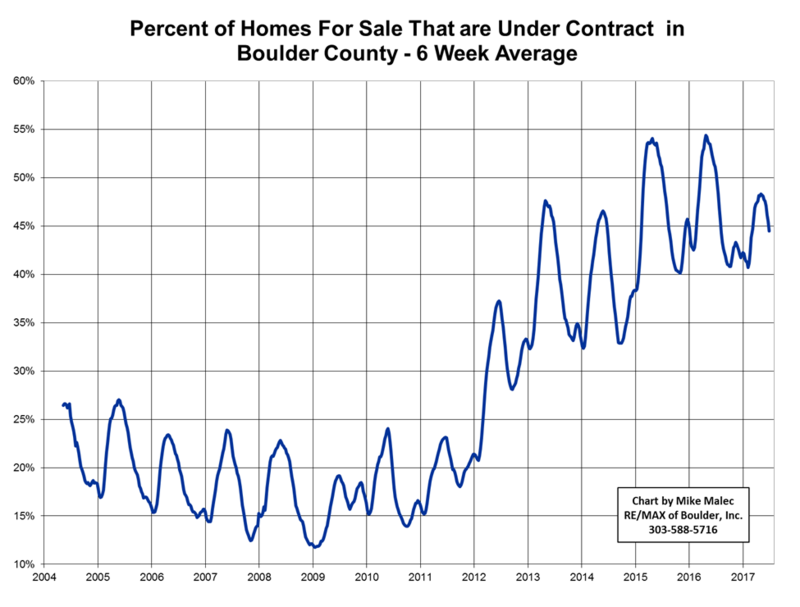 The busiest time will be just before and during the peak on that graph. You can also see the mid-summer slump and the rebound towards the end of the year in the past two years. The busy period will be before the peaks and rebounds due to the nature of the buyer’s need to look at homes prior to writing an accepted contract that shows up in graph. So, is this slower feeling time the mid-summer slump we’ve had the past two years or something different? I think it’s just the seasonal slowdown. I can’t point to any market force that would be causing something different. Local unemployment is still low. In-migration to our area is still strong. Mortgage rates are still at historic lows. The one possible market force that could be creating a market change is affordability. The large upswing in prices may have exhausted the stored buying power of the buyer pool. Mitigating that possible negative is the lack of future growth areas for the County. The lack of future new home building is an influence we’ve never had before so it’s hard to characterize what impact that will have on our market. If you’re a buyer, now is the time to be out looking. 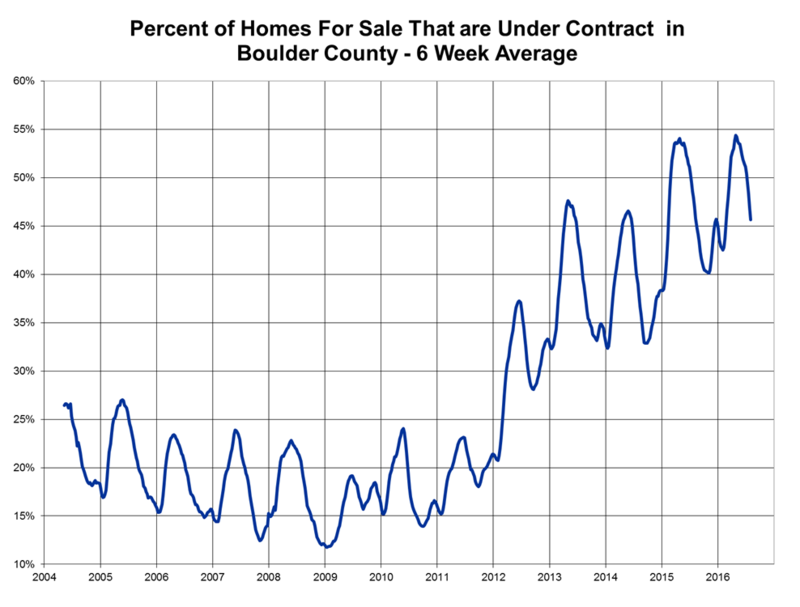 Generally sometime in August the activity will start to pick up again before it cools off for the end of the year holidays. Happy house hunting.